Compare the best racquetball goggles from this list based on helpful customer reviews, rating, and price. These products are shortlisted based on racquetball players choices and are refreshed regularly. See what the professionals are wearing and don’t miss out on the best rated and professional looking glasses available on the market. We all know how important it is to wear racquetball goggles. You are legally required to wear them if you are trying to compete in a tournament. Even if you are not, you don’t want to end up getting hit in the eye with a racquetball ball that’s coming in at 100 miles per hour. That is sure to leave some nasty injury to your eyes. But the problem isn’t the safety, it’s the fogging that builds up when you play with wearing eyewear. Not all of them will give you good ventilation, anti-fog, and anti-scratch lenses. 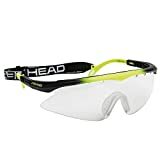 I’ve done some research, looked at a bunch forums and asked some regular racquetball players and found out that there are some goggles that can solve all of these problems. Lo and behold, here are my top 10 picks for the best racquetball glasses that don’t fog. The HEAD Power Zone Shield has the one-piece shield design that gives you very little distortion and great visibility all across the court. This single curve lens is lightweight the frame itself has high impact resistance. You’ll also notice that it has vents at the top of the lens that’s going to really help with those people that have fogging problems. They do have an anti-fog coating, but the vents really help as well. Moving on to the back, this eyewear has adjustable arms to fit a variety of sizes and then they have a foam padding to give you best fit on your forehead that also adds extra comfort and a great feel with this eyewear. The eyewear contains extra durable anti-scratch with 99.9% UV protection. For added protection, the frame has a shock absorbent brow bridge. They have also added a one-piece rubber nose bridge that’s going to give you a pretty secure fit. There is also a soft, non-slip nosepiece that enhances the comfort and fit. They have also added rubber pads on the back of the arms again to hold them tight on your head. The last thing you’ll notice is that HEAD includes the head strap out of the box attached for those of you that prefer it. If you are someone who always fogs up goggles, try the HEAD Power Zone Shield next time. For comfort, it has adjustable temples with rubber inlay. This provides a comfortable and secure fit for the user. With this strap, you’ll never have any problem with the eyewear coming loose or coming off your face. That is the Power Zone Shield Protective Eyewear from HEAD, do check them out. Great clarity and fog free. Stylish design and impact resistance. Good fit and stays in place. 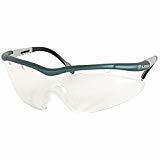 The Penn Head Impulse protective eyewear from Penn features an ultra-lightweight design with a sportier look. I really like the design of this glass and also the fact that this pair comes with an adjustable strap. All the best racquetball goggles should have straps. It provides a more secure fit and prevents the goggles from coming off during intense gaming sessions. It’s not all about the looks. This goggle is meant to protect players from eye injuries caused by fast-moving racquetballs — one-piece lens design for those of you that prefer that. These lenses are treated with an anti-fog coating which means you won’t have any trouble with fogging. Keep in mind that it won’t prevent fog as the ventilated goggles do. If you are someone who heats up a lot during the match, skip them and go for a ventilated eyewear. 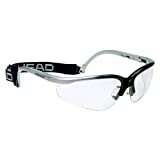 For most players, the HEAD Impulse Protective Eyewear will be good enough. Regarding comfort, it has those hinged style temples for adding an extra layer of comfort. It has a distortion-free shatter-proof polycarbonate goggle-style one-piece lens for maximum protection and stability. The adjustable slip-on/slip-on whatever you want to call it should keep you focused more on the game and less on the eyewear. It comes with a soft microfiber bag and a good fit for adults. Overall, this is a good eye pro for the price and provides good protection as well. My only concern would be the fogging issue. As I’ve said before, if you heat up a lot, skip this one. Also, no padding on the nosepiece, consider adding some Sugru if you don’t want a scar on your nose bridge. If you don’t have any problems with heating and non-padded nosepiece, this is best racquetball eyewear for the money. Shatter-proof distortion free polycarbonate lens. Hinged-style temples Adjustable clip-on strap. Ultra-lightweight design and crystal-clear vision. Anti-fog treated and super comfortable. Step on the court with a clear, crisp vision every time with Gearbox Vision Eyewear. First thing I need to say about the Gearbox Vision Eyewear is that they meet higher ASTM impact standard than any other eyewear in the market. This eyewear exceeds ASTM F803-11 Ball Impact Standards. So, for those of you that are looking for the very best protection, these are the ones to go with. Up next, they have a two-piece lens design for those of you that prefer that and very wide lenses that wrap around your face to give you the best visibility around the court and zero distortion. With this goggle, you’ll have a really clear view of everything around you. This eyewear has rubber pads at the back of the arms to hold them secure. These rubber pads keep your eyewear in place especially during an intense rally while providing comfort. Two rubber nose pieces to give you good comfort and a good fit. These are a very lightweight, very comfortable and great performance. To ensure the longevity of the product, you get a protective carrying case with purchase. Head to small or big? Don’t worry; the frame is one size fits all. They are not heavy but feels very sturdy. Once you get used to this glass, you cannot play with anything different. That’s the Gearbox Vision Eyewear, do check them out. Anti-scratch and anti-fog coating lens. Exceeds ASTM F803-11 ball impact standards. Very comfortable and has a secure fit. Available in three lens color. Stylish lightweight impact resistant frame. Spherical shaped distortion free polycarbonate lenses. Extra durable anti-scratch and anti-fog lenses. 99.9% UV Protection. Clear, soft, non-slip PVC nosepiece. Adjustable templates provide a comfortable fit. Adjustable temples provide a comfortable fit. Adjustable clip-on elastic strap hold eyewear in place. The HEAD Pro Elite Eyewear is HEAD’s top of the line eyewear, and the things I really like about them are the style, the fit and how light they are. You really won’t notice it when wearing, and that’s a good thing. It takes the distraction out of you, and you can focus more on the game. Overall, it’s a nice looking, stylish, lightweight, impact resistant frame. This frame has a spherical shape that keeps it distortion free — two-piece lens design for those of you that prefer that. And, they have adjustable arms on the back. They fit a wide range of sizes for those of you that have a hard time finding a proper fit; this is the safety glass that you should get. The extra durable anti-fog and anti-scratch lenses give you 99.9% UV protection. Another feature that I like about this eyepiece is that it has clear, soft, non-slip PVC nosepiece. It also has those adjustable templates that give you a comfortable fit. Not so tight or close as to pinch or leave a mark on your skin. You can see the ball clearly and protect your eyes from injuries at the same time. Great viewing angle thanks to the spherical shape two-piece lens design. It also comes with a high-quality lens cleaning bag. It fits snugly and feels light on the nose. I really like the fact that it has no distracting or vision blocking frame. You’ll also notice out of the package; HEAD has the head strap attached to the back for an extra secure fit. You shouldn’t have any problem with this coming loose while you are playing racquetball. It’s a good, protective, and clear eyewear but not as sturdy as the Gearbox Vision. Good clarity and good viewing angle. It comes with a high-quality lens cleaning bag. Distortion free spherical shaped frame. The Python Xtreme View Protective Racquetball Eye guard is considered as the budget king. It’s not the cheapest of the bunch, but at this price, it’s hard to beat this one. It has that classic design with adjustable side arms that will fit an average size head perfectly. Not only that, but you also get an adjustable head strap. This one is available in two color, black and white. At first glance, you will see that the lenses are vented. Which means they have good airflow and you won’t have any issues with these fogging up and blurring your vision. They are also extremely lightweight as well — an exceptional buy for this price. Even if you sweat a lot, you will get a clear vision at angles. The adjustable arms fit a wide size of heads. These are adult sized glasses and rated for impact protection. Keep in mind that it won’t keep sweat out of your eyes, but they help keep some at bay. However, the sweat will still work its way through eventually. But I wouldn’t worry about that too much. The vents do a great job of preventing clouding up. The fit is great on this one. They won’t slide down and are sturdy enough to protect your eyes from any type of ball. You won’t get any protective case with this one, but you will get a nylon bag. It’s better than not having anything at all. Couldn’t find any info on the lens material but they do meet or exceed A.S.T.M. Standard F803-97. As for the design, this is a two-piece design lens with soft, non-slip PVC on the nosepiece. They have good visibility even though they are just a basic pair of protective eye-wear. A small sweat guard would’ve been nice, but you get what you pay for. In short, you will get a solid feel of protection as well as comfort. It comes with a head strap. This is the official eyewear choice of HEAD pros and for many reasons. The Raptor features a new modern look and a durable, lightweight impact resistant frame. It has that aggressive sporty look if you are into those kinds of glasses. The temples are well fitted with rubber inlay that gives a comfortable and stable fit. The gradient black and red color give it a nice touch. The HEAD Raptor features a distortion-free polycarbonate lens. The two-piece design gives it more durability. These lenses are interchangeable and come in three versions so that your eyes can perfectly adjust to any court conditions. These are extra durable anti-scratch and anti-fog treated lenses. Which means you don’t have to worry about fogging or scratching. This is considered as the best anti-fog racquetball goggles money can buy. Not only do you have the anti-fog treated lenses, but you also get ventilation on top. It will give you maximum breathability. There is also that adjustable head strap in case you want to put it on. You don’t have to worry about this one slipping. You’ll get lenses for outdoor or extremely bright conditions, amber lenses for glass courts and clear lenses for all courts. With all of these features, you know this is not cheap. For additional comfort, the HEAD Raptor has a soft, non-slip nosepiece. It also comes with a high-quality lens cleaning bag. Meets ASTM F803.03 and ANSI Z87-1 impact standards for racquet sports. Since the glass fits so well, you don’t even need the strap. The only tricky part is changing the lenses, but you will get used to it over time. In short, these are the best fogless racquetball goggles you can find on the market right now. Anti-scratch and anti-fog coated lenses. Good ventilation and sturdy build. Designed for racquetball and squash. Three lenses for different scenarios. One piece AirFlow shield design with vented lens and impact brow bar. This is just like Ektelon’s Strobe eyewear except for this time it is all clear so, no obstructions in the corner of your eyes. They still got the vented lenses on the top which is going to allow maximum breathability. The best part is you can pop the lens back on the frame without a hitch. What’s unique about the Strobe eyewear is that they have got a band which rests along your forehead and keeps the bridge of the eyewear below and off of your forehead. That also creates a gap between the forehead and the glass which allows the hot air to rise out above your face. So, if you are one of those people that struggle from sweating and fogging of your eyewear, this is the one that you should be checking out. This is probably one of the best-ventilated pieces of eyewear on this list. It’s also very durable. Make sure to check this out. Even during intense matches, you won’t have any issues with fogging or sweat getting the lenses. The vent on the top is just what you need to prevent fog. Fewer seams and edges on the frame mean less distraction on your line of vision. These glasses sit comfortably and fit well. It also comes with a nice cleaning pouch. If you want to keep the lens from getting scratched, I would recommend buying a protective case. A goggle that has the vented lens and all clear pieces should be your top priority if you are just starting to play racquetball. 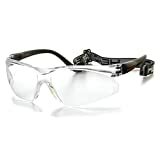 If you are looking for your first pair of protective eyewear, look no further than the Ektelon Strobe. They will feel so good on you that you won’t even need to bother with the supplied eyewear retainer. Breathable and low chance of fogging. This is a great looking and performing eyewear from E-Force, and the first thing you’ll notice is that it has the one-piece lens all the way across. If you prefer that look, in my opinion, it provides less distortion because it’s clean in the middle and you don’t have any spots that are unprotected. This design also makes this eyewear super lightweight. Next thing you’ll notice is that it has vents across the top of the lens. Great for you guys that have problems with fogging up. Another thing is that they have adjustable arms on this goggle so you can adjust from shorter to a longer length. The vented one-piece design also gives you a clear peripheral vision. As I’ve said before, there is literally no distraction on this goggle. They also have a two-piece rubber nose bridge with a connecting piece across the middle there that holds them nice and secure on your face. The wraparound design serves a good purpose for extending coverage. There are two different nose pieces to choose from if you want a more secure and customized fit. The E-Force crystal wrap racquetball eyewear will always deliver unsurpassed visibility in any lighting condition. Just because it’s very lightweight doesn’t mean that it’s not durable. In fact, this eyewear meets or exceeds USRA and ASTM F803-00 standards for racquetball. So, again with the adjustable arms and the rubber nose, they should fit a large range of sizes and with the vents in the front again great for anti-fogging, Anti-Fog, and scratch-resistant one-piece design and super comfortable. It comes with a soft cloth bag, not much to protect this eyewear, but you can just go ahead and buy a protective case for this one. It comes with a strap. The ProKennex Infinity Eyeguards is their top of the line eyewear, and the first thing you’ll notice is the completely clear frame. I really like that about this eyewear because you don’t have any dark colors in your line of sight distracting you while you’re playing racquetball. The anti-fog coated polycarbonate lens also has anti-scratch treatment for better durability. Like I said before, no distraction on this one. 180-degree distortion-free visibility keeps you focused on the game and less on the eye guard. Lightweight temple-arms with a padded forehead brim give you the comfort and protection you need from your goggles. Also, really large wide lenses in these, same thing here. Really good visibility, no distortion and very clear view of the entire court. No vents on these lenses but players that have worn them before had no problems with the fogging. This one won’t fit over your glasses. If you need something like that, check out the next product. Next thing you’ll notice some pads on the arms there to keep them holding tight on your head. A two-piece rubber nose bridge that’s connected in the middle for a really snug fit with this eyewear. You won’t have any problem with this coming off or coming loose while you’re playing. You will also get Detachable neoprene straps and chamois. Despite not having any vents on top, they rarely fog up. Fits well and very comfortable. ProKennex is a popular brand in the racquetball industry, and it’s hard for me not to recommend them in this list of best racquetball glasses. They are good at manufacturing strings, racquets, balls, and even gloves. Do check them out. This one is a bit different than what you have seen so far. As you can tell by the look of it, this one is for those of you that want a goggle that you can wear over your prescription glasses. This is Python’s over the glasses type eye guard that is perfect for entry level, recreational center or collegiate level at a great price. It has anti-fog lenses that are scratch resistant and an adjustable head strap to accommodate personal fit. It fits perfectly over prescription glasses. It can even fit over oversized prescription glasses. They are not the best over glass eyewear out there. The fact is, wearing over the glass goggles isn’t suitable for racquetball because of the distortion and loss of visibility. There are too many distractions, and I find them to be bulky and uncomfortable sometimes. If you want to enjoy the game of racquetball at its best, get contact lenses and buy the best anti-fog racquetball goggles you can find. Wearing a big piece of chunk like this would likely leave you disappointed. Now, this isn’t that bad as I’m claiming it to be. They are just a bit too much for my taste. You are always aware that they are on your face which is very distracting. If you absolutely need to play with them, go ahead. A lot of users found it comfortable; I think you too can make your way around it. Perfect entry level eye guard. How To Choose The Best Racquetball Glasses? Racquetball goggles are essential, not just for the looks. These are required for competitive play, and they also prevent balls from hitting the eye. These goggles have come a long way. Performance wise these are getting better each year and more stylish too. Don’t take the risk of playing racquetball without these glasses. And, you don’t want to look bad while wearing them, right? So, how do you pick a goggle that not only protects your eyes but will also make you cooler? Here is how. Read full buying guide below, and you’ll end up picking the best racquetball goggles in terms of both fashion sense and performance. What’s the most common excuse people don’t want to wear goggles in the first place? Fogging! And it’s a good excuse too. There were times when goggles used to fog up so bad; players would just ditch them. When your vision is fogging up, it becomes difficult to concentrate on the game. Lucky for you, those days are over. Most modern goggles are made using anti-fogging technology on their lenses. No matter how intense the game gets, your vision won’t get blurry. Here is how you can pick up an anti-fogging goggle. Just about every eyewear you see on the market is applied with anti-fog coating. It is applied to the lenses from the factory. These coatings prevent fog from building up inside. However, they tend to wear off over time. Mostly because of sweat, body heat, cleaning, storage, etc. If you have been using your glasses for a long time and it fogs up constantly, it’s time to switch to a new pair. Don’t worry, most goggles are fairly inexpensive, and you can also buy the cheaper ones and replace them when necessary. Or, you can go for a more high-end model which will last a long time. Totally depends on how much you spend time playing. Another alternative is to buy the anti-fog spray. I personally prefer vented lenses. More and more eyewear are now featuring these lenses, and even the pros are using them. The small vents on the lenses reduce heat and increase airflow inside ad stop fog before it happens. Look for vented eyewear if you want to alleviate the fogging problem. You should never wear eyewear that sits too close to your face. It will heat up and fog. Wearing one that doesn’t fit too tight will reduce fogging during the game. Quick Tip: Summer is the time when fogging bothers us the most. Here is a cool article I found about Solving the Problem of Fogged Eyewear. It’s more of a personal preference and really does not affect the performance at all. You can either go for a single piece lens design or a two piece one. It features an uninterrupted single piece lens from right to left with a one-piece nose pad. This type of eye guard is somewhat wide and covers more than just the eyes. It looks more like a traditional sunglass with two separate lenses. Smaller in size with separate nose pads that are more susceptible to falling off and getting lost. So far, I’ve covered all the important factors. But there are other features as well and why not have a look at them too? Some eyewear gives you the option to add the lens that you prefer. For instance, if you want to adapt to different lighting conditions, you can purchase a pair of lenses for that. Here are four different lens type for different lighting conditions. Tinted Lens: It is ideal for outdoor play. Amber Lens: You can opt for this one if you want to brighten up dark courts or at dusk when playing outdoors. Clear Lens: Normal indoor lighting conditions. Blue Lens: For increased visibility. Indoor only. This type of goggles provides practical functionality with a bit of old-school styling. Most of these eye guards are made from shatterproof polycarbonate, and you can fit them with prescription lenses by an Optometrist. Don’t expect to play with your normal glasses. They won’t give you the ideal protection you want on the court, and they are not designed to withstand high impact. Pick the best prescription glasses available on the market and have a safe match. Is your head too big or small? You don’t fit in the one size fits all (most) category? Don’t worry. There are safety goggles for you too. Click here to see what I’m talking about. Among the three different types of the lens material, glass gives you maximum clarity with zero distortion. However, it is also delicate and cannot withstand impact easily. Despite that, most renowned brands are using this material to manufacture lens because of the clarity and how good it looks on the eye. 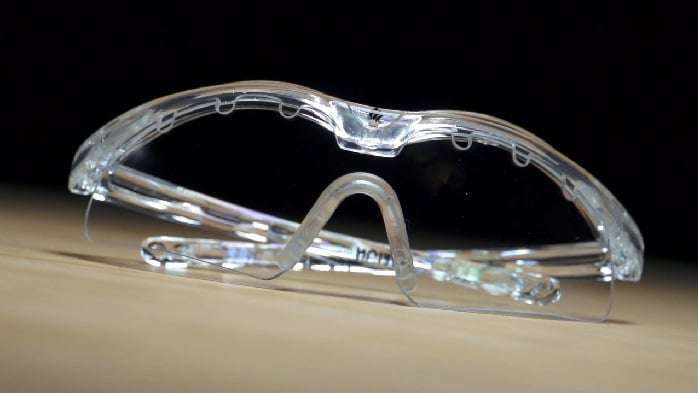 For a competitive sport like Racquetball, most of the players nowadays don’t wear glass lenses. During the game, the chances of having severe impacts are very high and small effect can shatter it into pieces. Also, it weighs a lot. Plastic sits at the middle of glass and polycarbonate. It is lighter in weight, has low distortion and has higher impact resistance than glass. However, it isn’t shatterproof. The best material for manufacturing goggle lens. It is a highly resistant material and doesn’t shatter on high impact. This is also the reason why most racquetball goggle maker uses this for making lenses. Even if the lens breaks, it usually breaks in larger pieces which is safer compared to smaller pieces. It is also the lightest material for manufacturing lens but with a slight drawback. Unlike plastic and glass, polycarbonate has maximum distortion. It is more exposed to scratches, but manufacturers use a coating to prevent that from happening. Quick Tip: Here is a cool article that explains in details about the Types of Sports Eye Protection. Next time you play at a racquetball tournament, make sure to wear proper eyewear. 1. Can a normal glass be used as a goggle? Heck no! They are not designed to withstand the impact. It will result in a bigger injury. Regular glasses should never ever be used in place of goggles. 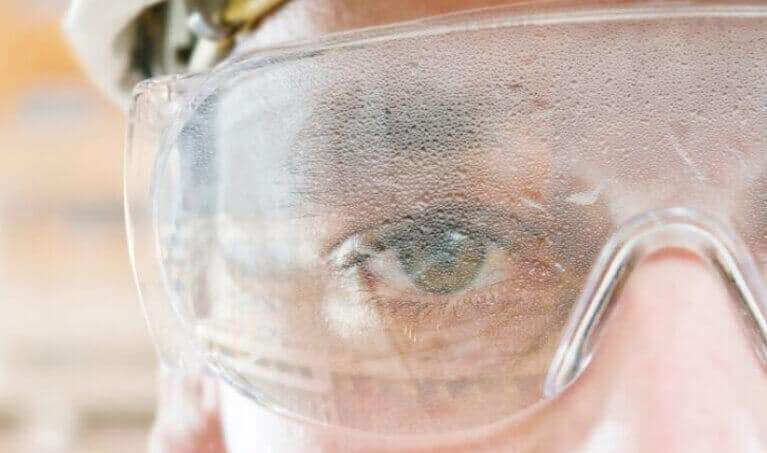 If you want to ensure the safety of your eye, always purchase high-quality goggles. You could also go for the prescription goggles too. If you don’t like the design of these old-school glasses, ditch them and wear contact lens underneath a cool looking racquetball goggle while you are playing. 2. How to clean goggle’s lens? Just a normal wipe with a microfiber cloth should be enough to clean the lens of your eyewear. However, if you want to make your goggles last longer, you need to clean them carefully. Avoid using rough cloth as it might leave a permanent dent/scratches on the surface. If you have dust accumulated on your lens, use specific lens cleaning cloth. If you don’t have one, any microfiber cloth piece will do. Make sure to rub gently. If you want a more thorough clean, you can wash your goggles too. Also, I don’t prefer washing as it removes the anti-fog coating on the lens. If you do need to wash them anyway, you can do dry cleaning using the cloth and some warm soapy water. Fill a container with normal warm water and soap to make some foam. Dip your glass inside and leave it for some time. After that, dry it with a clean, soft towel and make sure to air dry properly. 3. How long should I use a goggle before purchasing a new one? It depends on the quality of the goggle. There are some good ones and bad ones. Most of the time, quality eyewear would cost you around 20 bucks. There are cheap ones too that cost less than 10 bucks. A general rule of thumb is that as long as your goggle don’t fog up, you can use it for as long as you want. However, I don’t recommend using glasses for more than a year. That’s all I can say for now. It was quite a long journey and believe me, it wasn’t easy filtering and sorting all the products that are available out there. 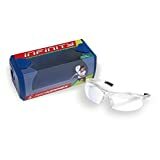 Hope my little effort was helpful to you and you can find the best racquetball goggles that don’t fog, give you the protection that you need and feel comfortable.